Looks much better with bacon on top. Everyone in LA seems to know that the place has no good beer culture, yet no one has really done anything to fix that. Sure, there’s BJ’s (no good) and a couple other microbreweries that are difficult to get to, but come on, LA is a huge city that deserves more. So when I left LA for Ann Arbor for a bit of a bachelor party, we headed to the Grizzly Peak Brewing Company. I’ve loved the Grizzly Peak for a long time, even dating back to before I could drink their beer and drank their micro-brewed root beer. I have a lot of great memories of the place and hoped that my most recent visit wouldn’t be a disappointment. While their menu switches things up every once in a while (ooh Bison Sloppy Joes?! ), their burger has been a constant source of satisfaction for me. Not wanting to be risky, I stuck with The Grizz Burger, which starts out with lettuce and tomato for $8.50 and goes up about 35 cents per topping. I ordered without the wasteful lettuce and tomato, then topped it with bacon and smoked gouda. I had it cooked medium and then got some fries for an extra buck fifty. As for the beer, they have some great staples and some seasonals to go with them. I stuck with one of their staples, a golden ale. It was 4 bucks for a pint or 4.95 for a 22-ouncer, so I opted for the 22. The beer came first and was just like I remember it”¦smooth, crisp and tad bitter; the kind of beer you could bring home to mother. Then came the burger. I’m pretty sure Grizzly Peak either changed how they serve cheese or I’ve never ordered it with gouda before, because I was surprised to find the cheese was shredded. I’m typically threatened by change, but I actually kind of liked the idea of this shredded cheese. It fit perfectly on the burger and didn’t cause any cheese to leak over the side. I also noticed that there was no bacon, so I immediately told my server who immediately grabbed some for me. Now I was ready to eat. Just like I remembered, the Grizz Burger was the perfect microbrewery burger. The meat was cooked just perfectly and was slightly juicy. 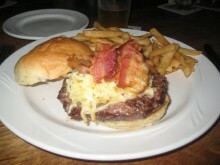 The smoked gouda and bacon added nice flavoring and the bun was just the right size. It is the pub burger by which all other pub burgers are judged. I say pub burger because I kind of feel like pub burgers fit into their own class. They don’t do anything crazy like load up with chili or extra patties. They aren’t huge, but they are definitely bigger than fast food. Essentially, they are made for good beer and good company, and by these standards, the Grizz Burger is just awesome.